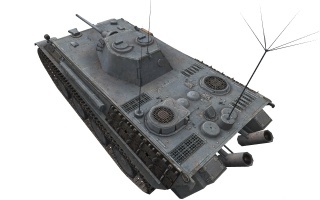 The Aufklärungspanzer Panther is a German tier 7 light tank. Un proyecto de un vehículo pesado de reconocimiento basado en el carro de combate Panther. El uso del casco y del chasis del carro ya existente facilitarían significativamente la producción en serie de los nuevos vehículos; una torreta más pequeña reduciría el peso y mejoraría la maniobrabilidad del vehículo. Sin embargo, el proyecto fue abandonado en la fase de desarrollo. 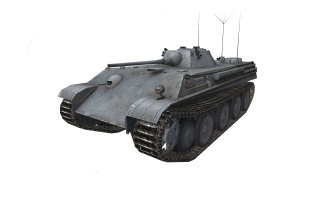 The Aufklärungspanzer Panther was replaced by Spähpanzer SP I C. in patch 0.9.9. The Aufklärungspanzer Panther marks the end of its German light line. Fast acceleration and respectful top speed (despite size) allows for fast relocation to offer support where needed. Good penetration (with great prem round) for a tier 7 scout. Good Radio and good view range. High cost of premium shells. Can be ammo racked from frontal shots. Very large silhouette, especially for a light tank. 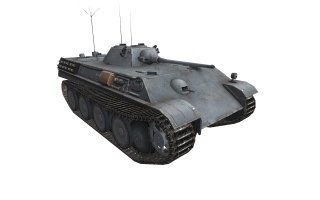 The Aufklärungspanzer Panther comes after the VK 28.01 and requires a completely different playstyle. Think of the Auf P as a Passive Scout/Sniper/Flanker and you will get an idea of how to play it effectively in most fights. In early game your main goal is to spot the enemy or fire from safe distance. Take into account that the camo is not the best for a light (or even some mediums). When firing from distance, aim for weakpoints or use APCR for harder targets. Wait till a side/rear shot presents itself to take on tougher tanks. In late game your main role is flanking, creating local superiority by turning enemy guns or decimating them with superior damage per minute and solid pen. When not focused, the Auf P is a very dangerous tank that will silently (low alpha) take away large chunks of health. Keep in mind that you can ram and come out on top in many situations. This can be very effective, especially versus enemy light tanks. Just keep in mind that on average, ramming heavies is not a great idea. The key points are that you have a large profile and below average camo for a scout and that while you fire fast, your damage per shot (alpha) remains low. If you have researched the 30.01D and 30.02D, or you have pursued the Medium and Casemate TD lines via the Panther and JagdPanther, respectively, you should have unlocked the second engine for the A.Panther. Mount it as soon as you can and you'll go from being a slightly faster Panther to almost as fast as an E-50. Unlock the top engine for 900hp at under 40 tonnes (22.5hp/t). 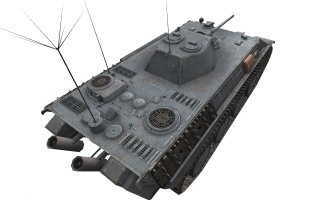 While the Aufklärungspanzer Panther project did exist in some form, there are no known records showing that it was to be mounted with the VK 28.01 Ausf. C turret, or any other armament other than the 5 cm Kw.K. 39 L/60.